The retention period is the time after which a deleted document is permanently removed from the library trash. The retention period begins at the moment the document is deleted and enters the library's trash. 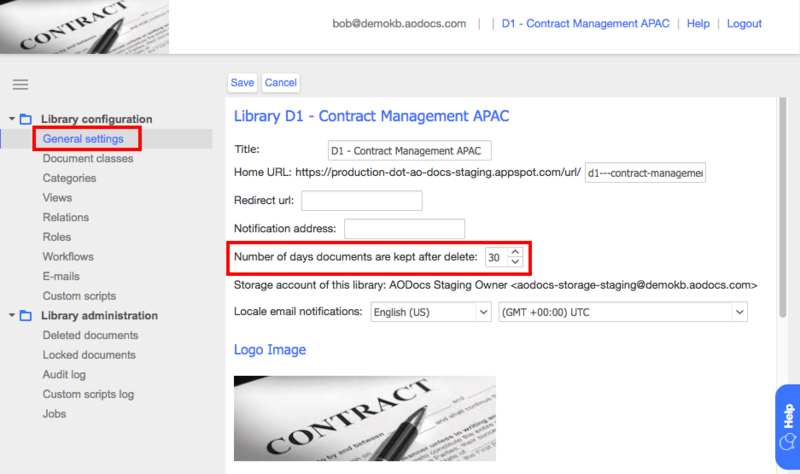 Once a document's retention period has expired, the document is permanently removed from the AODocs library within 24 hours. Note: A document removed from AODocs is still owned by the storage account but is not visible or accessible by anyone. The default retention period is 30 days but you can customize it. 3. Enter the number of days deleted documents should kept before being permanently deleted automatically. Tip: To never automatically delete documents from the company trash, set the retention period to -1.